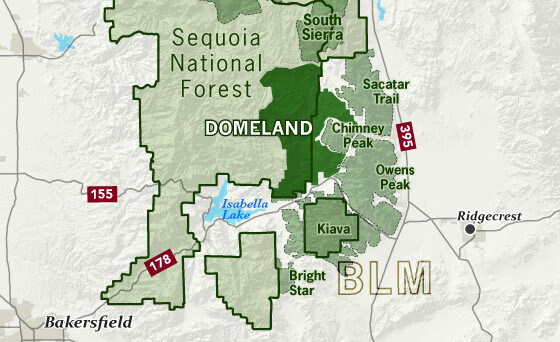 The Domeland Wilderness is located at the southern end of the Kern Plateau. This land was first protected by the Wilderness Act of 1964 as a 62,695 acre wilderness and was later expanded to 130,081 acres in 1984 to include the delicate transition ecosystems that meet to the east, south, and north of the original wilderness. These new additions, now jointly managed by the Bureau of Land Management and Sequoia National Forest, are rugged and dry. Though it is considered within the Sierra range, the Domeland Wilderness includes the overlap of several ecosystems to form unique plant and animal communities. The banks of the South Fork of the Kern River offer important riparian habitats of cottonwoods and meadows which stand in sharp contrast against the characteristic smooth domes and bold granite outcroppings. Domes that range from the size of a cottage to football fields across and spear-like jagged spires can be found in the Domeland. This range is one of the driest in the Sierra with the semi-arid mountains of the north and east crumbling into desert. Permits are not required for day use or overnight trips. Overnight camping is permitted though limited to 14 days. After 14 days, campers must relocate at least 25 miles from their previous site. Black bears are generally not a problem in the Domeland Wilderness, but it is always advisable to store your food properly. Campfires are allowed with a campfire permit. Gathering wood for campfires is limited to dead and down materials. Live vegetation cannot be cut. Domestic pets are allowed so long as they are under control and do not harass wildlife. Horses are permitted, however, you may be required to carry feed. 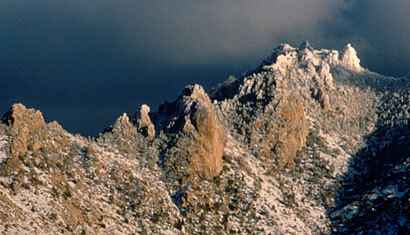 A world of contrasts, the Domeland Wilderness encompasses arid high desert as well as astounding granite formations.